Screenwriter Dana Fox was 2 for 2 when she followed her career trajectory question to Rob McElhenny on Scriptnotes episode #299 with a question to writer/director Rian Johnson about his career trajectory that led to writing and directing Star Wars: The Last Jedi. It’s also worth pointing out that Johnson graduated from USC film school (same school Star Wars creator George Lucas attended) where he made short films, and continued to make short films after school. When he finally got Brick made for $500,000 it won the the Special Jury Prize (For originality of vision) at the 2005 Sundance Film Festival, and won Best First Film at the Austin Film Festival in 2007. He then followed that success with The Brothers Bloom (2008), Looper (2012), and directed the Ozymandias (2013) episode of Breaking Bad, before given the Star War reins. A good example of being persistent and building on small successes that brought him to the intergalactic stage. I do believe that—as George Clooney basically said, and as the Carpenters used to sing— “We’ve only just begun.” Now an unnamed person or group (many believe connected to North Korea, though the government has denied) has taken the next step and threatened further damage to Sony Pictures if they released their movie The Interview—a comedy about a mission to kill the leader of North Korea—and any moviegoers who watch the film in theaters. The December 25 film release has been canceled. There has been much speculation about how the leak—and last month’s shut down of Sony’s website—could happen without some Sony—or former Sony—insider. (To paraphrase Shakespeare, “Hell hath no furry like an employee scorned.”) Perhaps we’ll never know the intricate mysteries behind the hack, but some of the information from it has been interesting. Of course, one could say Sony didn’t take the safe road producing a film that depicts the killing of the leader of North Korea. And I’ll defend Sony Pictures all day long with its AMC productions Mad Men and Breaking Bad. Neither of which were the same, safe, or soul-less. I don’t know the date of the “soul-less” memo—maybe it’s what led to taking a chance with creators Matthew Weiner and Vince Gilligan. And lastly, while I haven’t seen it yet, there doesn’t appear to be anything safe or soulless about Sony’s recent release Whiplash, written and directed by Damien Chazelle. P.S. Countdown to 2000th special post on January 22, 2015—14 posts. 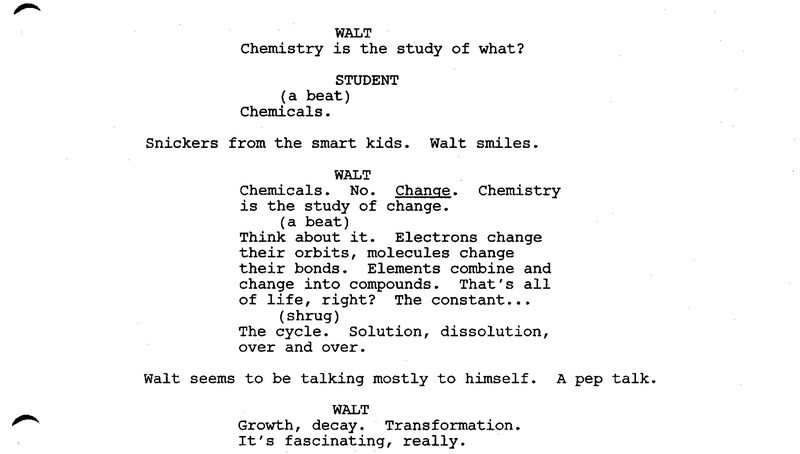 Are you ready for a chemistry lesson that will transform your screenwriting—maybe your life? I hope so because in less than 60 seconds Walter White not only gives us a glimpse into chemistry, but one that nails the overarching theme of the Emmy-winning Breaking Bad, and at the same time gets to the heart of storytelling—and perhaps the history of the human race. Can you really do that in just 60 seconds? Well, I don’t know if you can—but Breaking Bad creator Vince Gilligan did. You can read the full Breaking Bad pilot script dated 5/27/05 online, but here’s how Bryan Cranston as Walter White spoke the words in the pilot directed by the writer Vince Gilligan. “It is growth and decay, and then transformation”—that sentence packs a punch. And as we’ve learned in books, TV shows, and movies— as well as world history— that transformation is not always positive. Part of the fruit of Gilligan’s idea during a slow time in his writing career is the 2014 edition of Guinness World Records listed Breaking Bad as the Highest-Rated TV Series. P.S. It’s a good thing Gilligan created Breaking Bad, because that Walmart greeter position he was thinking about became a casualty in 2012 when they first eliminated the 10 p.m. to 7 a.m third shift greeters and I’m not sure they have any greeters now. Or if they do their role has been diminished. Experts said it had to do with a mix of the down economy and competition from Dollar General stores and Internet shopping. If your options are to work at Walmart or create an Emmy-winning TV, go with the latter. But if you do work at Walmart (or H&R Block) I’m sure there is plenty of inspiration surrounding you for at least enough material for one screenplay. 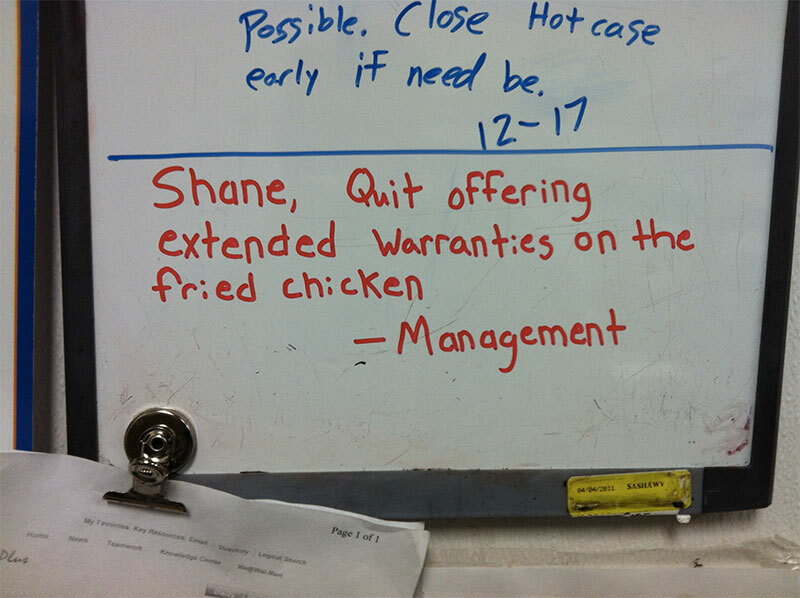 Maybe you saw the photos that went viral this year that were supposedly signs from Walmart management to an employee named Shane. Don’t Quit Your Day Job (2.0). If you’ve seen even one episode of Breaking Bad you know that the AMC TV show is set in New Mexico, but the story has west coast roots—and actually touches on a deeper problem throughout the United States. So off to New Mexico they went on the way to producing what would be a five year run resulting in two Emmy Awards for Best Drama. And embracing the new environment, Gilligan and his team of writers found new creative opportunities for conflict that were regionally centered in a way it wouldn’t be if they shot the series in say Vancouver or Atlanta. It may have been a happy accident that Breaking Bad landed in New Mexico, but I do believe they would have found fresh story elements no matter where they went. Ever heard of Oelwein, Iowa? Back in 2009 Nick Reding published a book called Methland; The Death and Life of an American Small Town, based on two years of life in Oelwein. I lived in Iowa from 2003-2013 and was warned in my first year to be careful when I wandered off the beaten path with my camera. I lived in Miami when it was the cocaine capital, I lived in Orlando when it led the country in heroine overdoses, and I lived in L.A. when the crack epidemic hit town, but nothing shocked me more than learning about meth and its destruction in small town America. So the timing was right for Vince Gilligan to unleash Breaking Bad into the world. 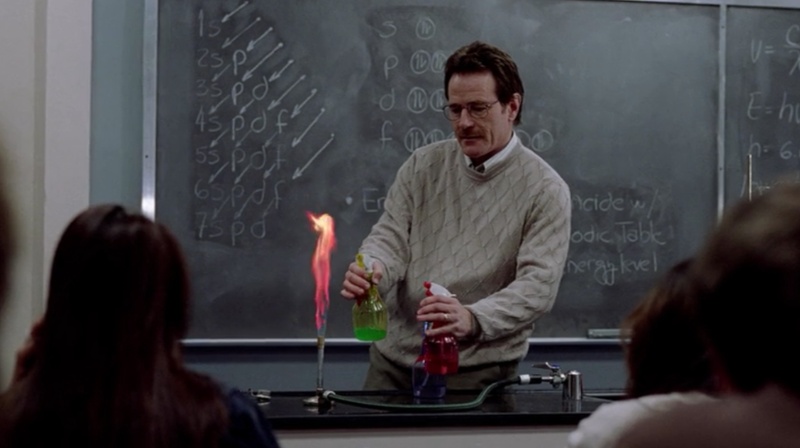 The story of a high school chemistry teacher at the end of his rope will never be confused with a Disney fairytale, but it hit home for millions of viewers living through the fallout of a major financial crisis. Vince Gilligan: I would have to say television, because once you are on a writing staff, or once you create a television show, for as long as that show exists you know that you’re writing, you know that your work will get produced. The same can’t be said for writing for features, unfortunately. Write a movie script, you can put your heart and soul into it for months, for years, and peddle it around Hollywood and ultimately it may well go nowhere. I’ve experienced more heartbreak in the movie business than in the TV business. In the next day or two we’ll take a road trip of sorts and see how Gilligan went from Richmond, Virginia to New York City to Los Angeles to Albuquerque, New Mexico on his way to becoming a two-time Emmy winner.